Supports heating mode and cooling mode. High precision 0.1 Celsius and 0.1% RH. Real-time display of temperature and humidity. XH-M452 use ST controller and high-precision temperature sensor probe. Good performance and accuracy. Simple panel control, wide temperature range, simple design, elegant appearance, high mechanical strength. 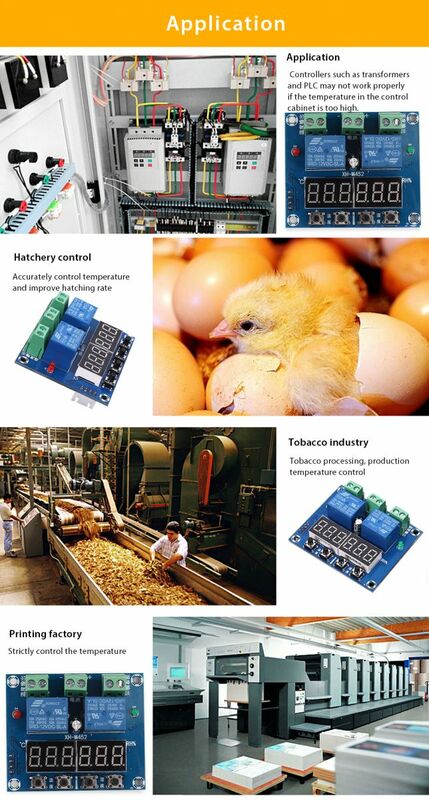 It can be embedded industrial equipment, convenient and fast. It can be used for hatch control, equipment cabinet, air conditioning system, temperature control protection, etc. ‘Temperature +’ : Short press to display start temperature; Long press to set start temperature by key ‘Temperature +’ and ‘Temperature -’ and display will flashing. It will save automatically after 5 Seconds. (Long press is for 3 seconds). ‘Temperature -’ : Short press to display stop temperature; Long press to set stop temperature by key ‘Temperature +’ and ‘Temperature -’ and display will flashing. It will save automatically after 5 Seconds. (Long press is for 3 seconds). ‘Humidity +’ : Short press to display start humidity; Long press to set start humidity by key ‘Humidity +’ and ‘Humidity -’ and display will flashing. It will save automatically after 5 Seconds. (Long press is for 3 seconds). ‘Humidity -’ : Short press to display stop humidity; Long press to set stop humidity by key ‘Humidity +’ and ‘Humidity -’ and display will flashing. It will save automatically after 5 seconds. (Long press is for 3 seconds). Note: Restore factory settings if keep press ‘Temperature -’ and ‘Humidity +’ until two screen flashing and display ‘888 888’ at the time. Set Start Temperature: Long press ‘Temperature +’ to set start temperature by key ‘Temperature +’ and ‘Temperature -’ and display will flashing. 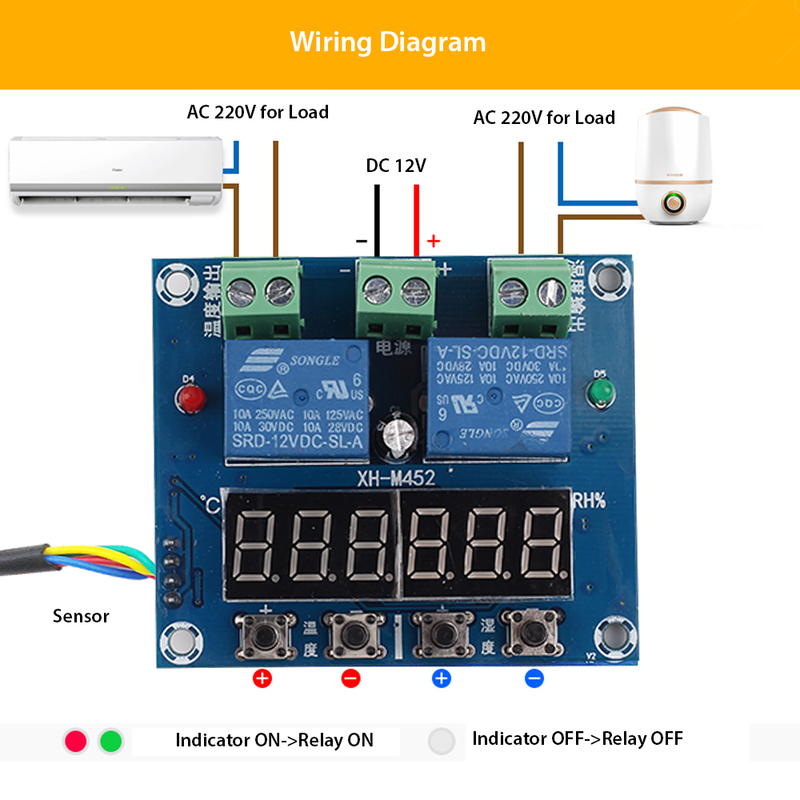 It will save automatically after 5 seconds and then display current actual temperature. Set Stop Temperature: Long press ‘Temperature -’ to set stop temperature by key ‘Temperature +’ and ‘Temperature -’ and display will flashing. It will save automatically after 5 seconds and then display current actual temperature. It is Heating mode if Start Temperature is lower than Stop Temperature. It is Cooling mode if Start Temperature is higher than Stop Temperature. Heating mode example: Control water heater. Heated to 65 Celsius and then stop heating. Reheat when the temperature drops to 50Celsius. Step 1 : Set Heating mode, Start Temp < Stop Temp. Step 2 : Long press ‘Temperature +’ and Start Temp flashing. Set Start Temperature to 50 Celsius by ‘Temperature +’ and ‘Temperature -’. Step 3 : Long press ‘Temperature -’ and Stop Temp flashing.Set Stop Temperature to 65Celsius by ‘Temperature +’ and ‘Temperature -’. Cooling mode example: Control farms. Stop ventilation when temperature is 26 Celsius. Refrigeration again when the temperature rises to 30 Celsius. Step 1 : Set Cooling mode, Start Temp > Stop Temp. Step 2 : Long press ‘Temperature +’ and Start Temp flashing. Set Start Temperature to 30 Celsius by ‘Temperature +’ and ‘Temperature -’. Step 3 : Long press ‘Temperature -’ and Stop Temp flashing. Set Stop Temperature to 26Celsius by ‘Temperature +’ and ‘Temperature -’. NOTE: Indicator will OFF and Load will not work If the temperature is set incorrectly. So please check if Start Temp and Stop Temp are right after set. Set Start Humidity : Long press ‘Humidity+’ to set start humidity by key ‘Humidity+’ and ‘Humidity-’ and display will flashing. It will save automatically after 5 seconds and then display current actual humidity . Set Stop Humidity : Long press ‘Humidity-’ to set stop humidity by key ‘Humidity+’ and ‘Humidity-’ and display will flashing. It will save automatically after 5 seconds and then display current actual humidity . Automatic mode selection : It is Humidification mode if Start Humidity is lower than Stop Humidity. Humidification mode example: Fresh storage humidification, control humidifier 50% RH to begin humidification, humidify to 80% RH stop. Step 1 : Set Humidification mode, Start Hum< Stop Hum. Step 2 : Long press ‘Humidity+’ and Start Hum flashing. Set Start Humidity to 50% RH by ‘Humidity+’ and ‘Humidity-’. Step 3 : Long press ‘Humidity-’ and Stop Hum flashing. Set Stop Humidity to 80% RH by ‘Humidity+’ and ‘Humidity-’. Dehumidify mode example: Dehumidification control system in the workshop, humidity 70% RH starts dehumidification, humidity 40% RH stops dehumidification. Step 1 : Set Humidification mode, Start Hum> Stop Hum. Step 2 : Long press ‘Humidity+’ and Start Hum flashing. Set Start Humidity to 70% RH by ‘Humidity+’ and ‘Humidity-’. Step 3 : Long press ‘Humidity-’ and Stop Hum flashing. Set Stop Humidity to 40% RH by ‘Humidity+’ and ‘Humidity-’. How to restore factory settings? A : Keep press ‘Temperature -’ and ‘Humidity +’ until two screen flashing and display ‘888 888’ at the time. A : Sensor failure, please test the sensor or replace the sensor. A : Test temperature exceeds the measurement range, please replace the use of the environment. Why the indicator does not work and the load does not work? A : Please check if Start Temp and Stop Temp are right.